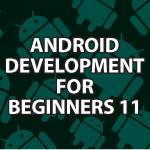 In this part of my App Inventor tutorial I will start covering Android interface design. I want the weather app we have been creating in parts 9 and 10 of this series to look very nice. Here I’ll show you how I created the layout and I’ll also walk you through the techniques needed to draw all of your icons in Inkscape. The vector art is available here. Here is an Inkscape video tutorial if you’d like to learn more. I don’t know if this is the right place to make this request but I would like your help. I’m new to this app inventor thing but I already went through 8 lessons and start making my own app. I need to have a button that I press, reads my location and get me directions to a certain place I determined in the app. I saw some things already as to how to get my location, and how to have a geo link. But is it possible to connect the two, so that when it opens google maps it already gives me directions to a certain place. Very nice tutorials you made, hope you continue. They are very easy to follow! You’re very welcome 🙂 Many more tutorials are coming. How make Blogs for free? also difference between blogs n forums? A forum is based around numerous people contributing content. A blog is mainly one person contributing the content. How to make Blogs for free? It’s a few days I’ve discovered what great job You are doing with all this tutorials. Just a question: Is it true that with the “AppInventor-Java connector” it is possible to get out the java code corresponding to its AppInventor project? May You place a Tutorial on this? Thank you very much 🙂 No you can’t get at your specific Java code by decompiling it. There are other tools largely based on App Inventor though that provides the Java code. I’ll cover them. Your vector art is in .pdf, unuseable? You can open up pdfs in most any graphics program.